My girlfriend and I found a suite at the Hard Rock Hotel for 54$. The room had a strange smell, like someone had tried to conceal a pile of dirty laundry with cheap perfume. The kingsize bed, however, was the most confortable I’ve ever slept on. We also had a great view of the tropical lagoon styled swimming pool and the Strip a few blocks away. We woke up early Monday morning around 8 am, packed our gear for the day, showered, and hauled everything down to the car. We had perfect blue skies and the dashboard thermometer said it was 60 degrees. We headed across the street to pick up my brother, his girlfriend and our buddy Harrison from the dumpy hotel they stayed at called the Baymont. The hotel didn’t even have a sign. I was a little worried they were going to spread bedbugs to our car. We headed South out of the city to the trailhead. We made a fifteen minute stop in Boulder City for sandwiches at Subway. I devoured half of a 12 inch and stored the rest in my pack. I planned to eat the rest on the Colorado River. About ten minutes after we passed through Boulder, Lake Mead comes into view. It’s strange to see so much water in a desert. about a ¼ mile from the parking area for the Hoover Dam overlook, so we walked across the bridge and snapped a few pictures. It only took about 20 minutes. After the overlook, we backtracked less than a mile to the trailhead for Goldstrike Canyon and parked our car on the side of the dirt road. There were about a dozen other cars parked at the trailhead. We made our way downhill on the wide gravel trail and passed under the enormous freeway overpass. There were a lot of old car parts strewn on the sides of the trail that people probably dumped off the bridge. The trail into the canyon is pretty straightforward and nearly impossible to get lost in because the walls are so high. There are several places where we had to use hand-lines or ropes to navigate over the large boulder fields. After about 45 minutes, we made it to the first hot spring pool. Its located in a very narrow part of the canyon and we had to slide down a large slippery rock to get to it. Some redneck was smoking and the combination of the hot water vapor and the cigarette smoke made me gag, so we headed on to the next set of hot springs. From here, the trail gets a bit more difficult. 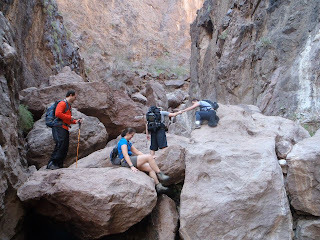 There are several places where we ran into difficult rock-scrambles. There are hand-lines set up on the trail. But they look old and unsafe, so we used our own. I decided to get off trail and I attempted to climb down a large 60 foot waterfall. I got tuck about halfway down and had to climb back up through the muck and slime. We made it to the next set of hot springs which were several pools spread our over a ¼ mile of the trail. The pools had been built up with cement and bags of sand. 2 of them were at least 5 feet deep with temperatures over 100 degrees. We decided to hike past them and eat lunch on the Colorado River. The last half mile of the trail is the best. There are several places where boiling water flowed down the rock face and fed a hanging garden of plant life. 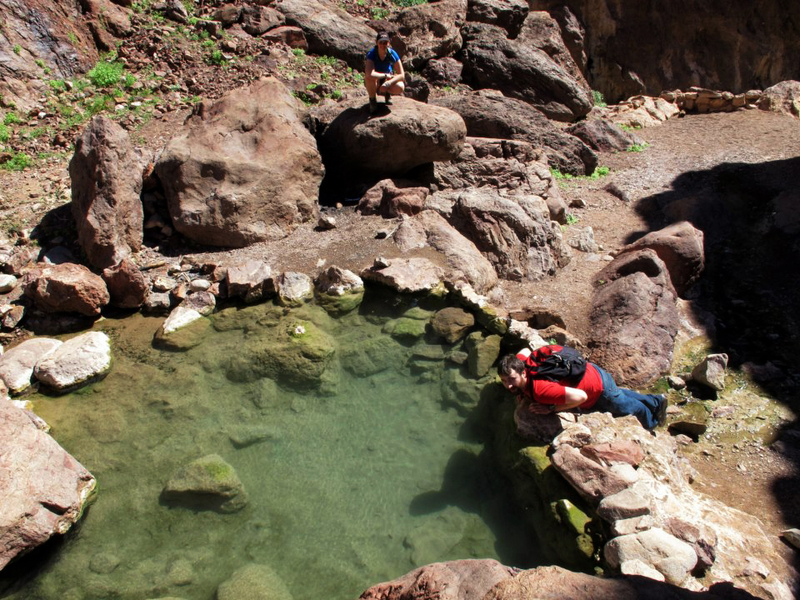 The final 2 hot pool is located within sight of the Colorado River. The one fed by the creek and the waterfall is about 90 degrees, while the final pool against the right hand side of the rock wall is at least 110 degrees, probably hotter. I sat on the banks of the Colorado river and ate the second half of my sandwich. A family of ducks quacked at me the whole time I ate because they wanted me to feed them bread. 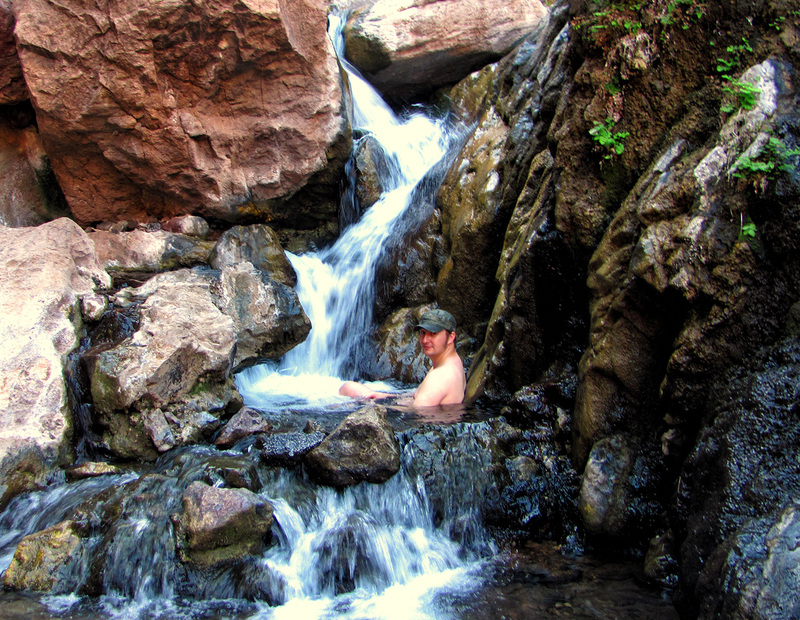 We spent the last part of our trip bathing in the hot springs before we headed out of the canyon. My legs felt like Jello on the return trip because the hot water had relaxed my muscles. I should have jumped in the river to tighten my legs back up. The entire hike took us a little less than 4 hours including the stop at the bottom. I can honestly say it was one of the best hikes I’ve ever done. I plan on renting a boat this summer at Willow Beach and traveling back up the river to do the hot-springs again. From Las Vegas, head south on route 93 through Boulder City. About 3 miles past Boulder City, you take the exit for route 172 (hoover damn access road). Continue for another ¼ mile to the Hoover Dam parking area. From the Hoover Dam Parking area, you head up a few flights of stairs to the overlook. You walk out on a pedestrian footpath that spans the Colorado River and look down several hundred feet into the canyon for a clear view of the Hoover Dam, The Colorado River and Lake Mead. To access the Goldstrike Canyon Trailhead from the Hoover Dam Parking area, just turn around and drive ¼ mile back towards the exit for route 93. Instead of getting onto the highway, drive underneath the large bridge and make an immediate left onto the dirt road (Goldstrike Canyon Road). The trailhead is usually packed, so take the first parking spot you find.